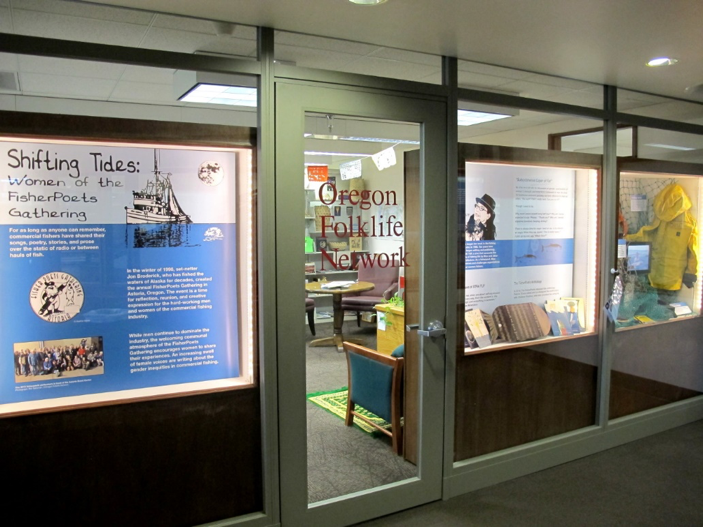 In September, OFN opened the exhibit “Shifting Tides: Women of the FisherPoets Gathering” in our Knight Library office Window Gallery on the University of Oregon campus. 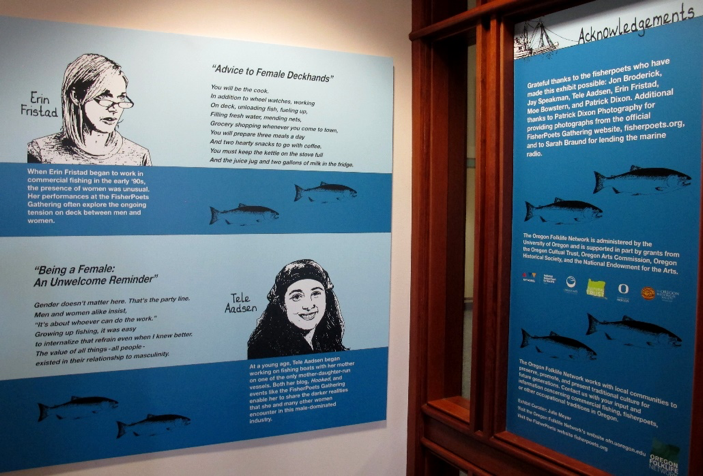 This exhibit highlights the creative work that women fishermen Moe Bowstern, Erin Fristad, and Tele Aadsen perform at the annual FisherPoets Gathering in Astoria, Oregon. The FisherPoets Gathering encourages commercial fishermen to share their occupational experiences through their creative expressions. The Gathering offers women fisherpoets a space to begin disrupting the underrepresentation of women working in a predominantly male occupation. The exhibit consists of three cases and two wall panels. The first case provides a brief history of the FisherPoets Gathering, while the second provides an excerpt from Moe Bowstern’s “Subcutaneous Layer of Fat,” a prose work that addresses sexist expectations for women fishermen. Copies of the FisherPoets Anthology, Anchored in Deep Water, and Bowstern’s XTRATUF zine line the bottom of the case. 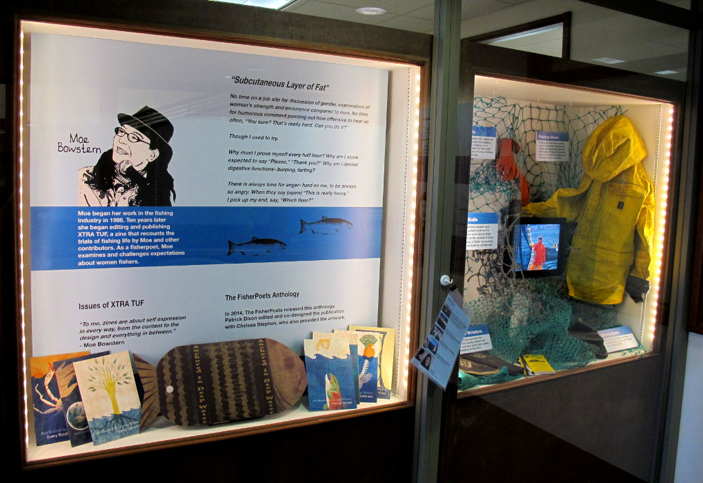 The final case displays fishing gear, commercial grade rain gear, netting, a slide show of women fishing in Alaska, and various other objects that exhibit coordinator and folklorist, Julie Meyer, gathered during her fieldwork on commercial fishing in Bristol Bay, Alaska. A final panel provides excerpts from Erin Fristad’s poem “Advice to Female Deckhands” and Tele Aadsen’s prose piece “Being a Female: An Unwelcome Reminder” both of which deal with issues of inequality that women fishermen face. The exhibit will be on display through mid-February 2016.